Military Note In Oct. 1654, he served as a trooper in a force of 60 men under Maj. Simon Willard, sent in a 16 day expedition into Rhode Island against Ninigret, sachem of the Niantic Indians. Family 1 SARAH STEARNS, b. 22 Sep 1635, Watertown, Middlesex Co., Mass. Family 2 Abigail Carter, b. 24 Apr 1648, Woburn, Middlesex Co., Mass. His home was located near the present junction of Lincoln and Weston Streets in Lexington, Mass. He built it in 1655 and seven generations of Stones lived there and were born there. In 1820 it passed to Jonathan Simonds whose executors razed it about 1847. He moved to have the area made into its own parish, signing a petition in Oct. 1682 that failed. Once established in 1691, he was one of the largest subscribers to the fund to erect the meeting house and was taxed highest when the first ministerial tax was assessed. On the formal organization of the Lexington Church, he was named the first Deacon. And in April 1711, he was one of the largest subscribers to purchase lands near the meeting house for a public common. He was active in fighting to have �The Farms� incorporated into its own town as well (Lexington was incorporated on 20 Mar 1713. 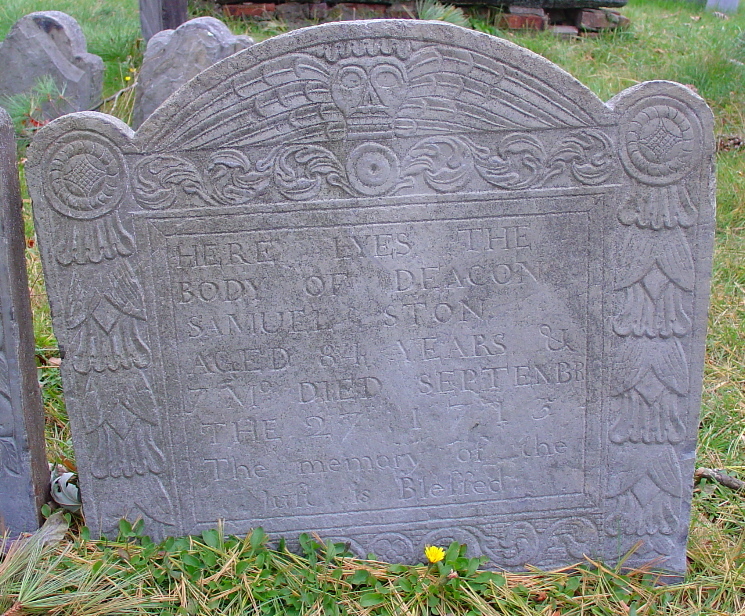 He was a selectman of Cambridge in 1673, 1681, 1688 and 1692, and assessor in 1694, 1697 and 1698. His estate was valued at �1,000. (See Middlesex County Probate Records, No. 21712) His will left some land to his �cousin� Abigail Baldwin wife of Henry Baldwin. One source says that he was born in 1635, died in 1713 and was 84 -- the math doesn�t work.